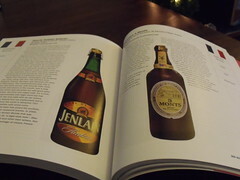 Did you know I had a beer photo in a book, a proper book, 300 Beers to try Before you Die! 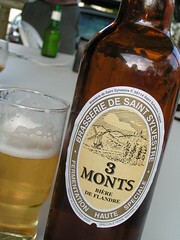 My photo of St. Sylvestre, 3 Monts from France, is included in the CAMRA (campaign for real ale) Book, 300 Beers to try Before you Die! by Roger Protz. I was contacted by them to ask if they could use my photo, they had seen it on Flickr and needed one for the new edition. I agreed and got a complimentary copy of the book as soon as it was published. Since then I have been having a go at trying to collect all of the 300, I haven't been very successful, only got about a third up to now but the quest continues. 300 Beers to try Before you Die! As for the beer well, at 8.5% a light gold colour with a thin head, it had a slightly sweet aroma, a fruity taste and it felt strong, it was very nice though. That's quite an honour Ralph. Good luck on your 300-beer quest... I attempted a similar thing in Amsterdam for my birthday. I had a book entitled 'Amsterdam in 80 Beers' in which it gave a different ale to try in each pub (or cafe as they're known over there). Managed to do about 38 in the 4 nights we were there. 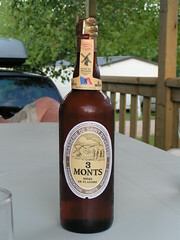 3 Monts was the beer listed for Cafe Spuyt. 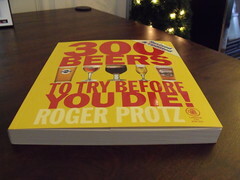 I haven't read the '300 beers' book by Roger Protz you mention but have a couple of others that come in handy for some of the reviews. Protz has a good website for beer news your probably aware of. We are off to Holland in May and will probably pop into Belgium beer hunting. We have never had more than a Day at a time in Holland before.